Scaling new heights « Just Stop Eating So Much! I make no secret of being put on strict diets since the first grade – and then continuing the tradition of different types of diets (the tried, the true, the super wacky) even after I was old enough to fully be in control of what I ate. The one thing they all had in common (besides me cheating on every single one)? They all included the key component of weighing one’s self – whether it be once a day or once a week. Thus, I quickly associated whatever number the scale was showing me with either success or failure. Nothing else mattered except that almighty number on the scale. And as that number increased over the years (to 450 pounds and more), I gave the scale more and more power. Talk about a false prophet. This obsession with weighing myself to track my ‘progress’ (define that how you will) culminated one morning after graduating from college with my then digital scale registering no number at all. Instead, I found the scale reading, “ERR.” As many of you know, I later discovered in the scale’s manual that ‘ERR’ was the scale’s code for “Error,” as that particular scale didn’t register any weight in excess of 450 pounds. Although a sobering experience, many more years would pass before I just stopped eating so much – and finally got my binge eating under control. Looking back, I realize that the scale was providing more than just a snarky editorial comment with ‘ERR’. It turns out I was putting way too much emphasis on what the scale was registering, when at over 450 pounds, my breathlessness and general shortage of good health (not to mention miserable social life and total lack of self worth) was already telling me everything I needed to know. I was giving the scale too much power – and this continued even into recent years, long after I’d taken and kept off over 275 pounds. Finally, about four years ago (even after keeping most of the excess weight off for years), I realized just how much power (mental and otherwise) I was still giving the scale. If the scale was registering a higher weight, I was crushed (and this would lead to some kind of action that would further defeat my self-esteem). If the scale registered a lower number, then I was in a good mood, had pep in my step and would easily choose salad over a milkshake. But the scale was my mood setter to be sure. Thus, I picked the scale up off my bathroom floor, wrapped it in a plastic bag (to protect it from dust) and shoved it under my bed. That’s right… I decided to just stop weighing myself… And the results were incredibly freeing. Suddenly, I wasn’t defining myself by a number. Instead, I was getting in touch with what my clothes felt like when on. Was I fitting into my “skinny” clothes without the threat of popping a button and putting someone’s eye out? Was I feeling robust and energetic even after eating a meal? Or tired and lethargic? Without the scale to rely on, I was finding all sorts of feedback about my weight, my health and (most important of all) my attitude. To say the experience has been freeing is an understatement. And yes, there are days the jeans are a little snug. So I amp up the exercise and add a little more vegetables and fruits to my eating repartee until the clothes are looking and feeling good again. For me, this has become a much better barometer for staying in shape than numbers on a scale that could send me into total depression were it to register 180 instead of 175. In fact, I consider the scale such a potential downer to my self-esteem, that these days even when I weigh at the doctor’s office, I insist on keeping my eyes closed and tell the nurse to write my weight down on the chart and not to announce it. Is this a little extreme? Who the heck cares? I used to weigh over 450 pounds and now I don’t. So I think I’m allowed to be a little extreme. And I think you’re allowed to be, too! Now, I’m not saying that using the scale to track your progress as you get rid of excess weight can’t be a good marker of your progress. But I do urge everyone reading this to think of the scale as just one tool in the battle against obesity. Do not make it your be all, end all in terms of how you’ll feel for the rest of the day, mentally. Body weight can be affected by so many different things (your hydration levels, your recent sleep patterns, salty foods you might have consumed, stress, etc. ).So don’t put all of your worth into a number (whether it be higher or lower). Think instead about how your tight jeans feel. Are they looser? Can you breathe when you sit down? And speaking of breathing, how do you feel when you’re out and about? Are you moving easily and without any shortness of breath? Are people noticing the twinkle in your eye? Do you find yourself smiling more? These are all indicators of your success and, quite frankly, mean a heck of a lot more than whatever number that scale’s registering. So whether you follow suit and put away your scale forever, or decrease your weigh-ins from once a day or week to once a month or intervals even further apart, I urge you to take away the power that you (we!) have given the scale all these years. The number its registering has absolutely no reflection on who you are as a person. And, like me, you just might find that paying attention to other indicators proves to be a healthier – and happier – way to track your fabulosity. Do you have a love/hate relationship with your scale? Or a tape measure? 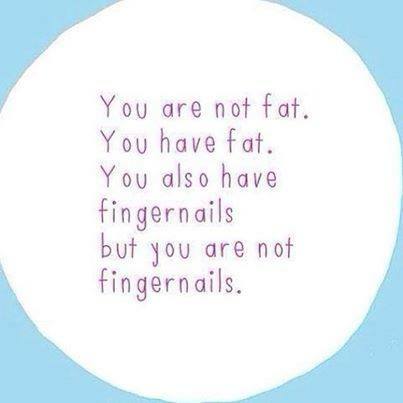 Or some other tool you’re using to battle the bulge? I’d love to hear all about it. So please – post away (or a-weigh, as the case may be). This entry was posted on Monday, February 16th, 2015 at 1:06 pm	and is filed under Mood. You can follow any responses to this entry through the RSS 2.0 feed. You can leave a response, or trackback from your own site.